NOTE: This Website is currently being re-designed. If you think it looks different each time you log on, don't be concerned. It's not you, it's us. If you don't see something where you thought it should be, look around the site; it has either been moved or removed. Tim Guinee, Hudson Valley resident, actor and leader in former Vice-President Al Gore’s Climate Reality Project will present three free slideshows with discussion of the latest science regarding climate change in our area. The Climate Reality Project is a diverse group of individuals who seek to catalyze a global solution to the climate crisis by supporting urgent action on climate change across every level of society. Weds., April 11 at 7 pm: Climate Change, Hope and the Interfaith Community at Holy Cross/Santa Cruz Episcopal Church (Parish Hall), 30 Pine Grove Ave., Kingston, NY, 12401. Free and open to the Public. Sponsored by the Kingston Interfaith Council. With panel of faith leaders. Thurs., April 19 at 6 pm: Climate Change, Hope and the Hudson Valley at SUNY/New Paltz, LC 100, with panel of student activists (Katie Gregory, Lyndsey Cooper, Isabelle Hayes, & Billie Gollah) to follow to inspire the other students. Sponsored by the SUNY New Paltz Environmental Task Force. All are FREE and open to the public! Urge Cuomo to halt ALL New York fracking infrastructure NOW! Yesterday was President's Day and Governor Cuomo's office was closed. This week – on “Call Cuomo Tuesday” – we call on Governor Cuomo to act with Presidential leadership and halt ALL New York inFRACKstructure NOW. Yet, today, we have seen continued expansion of pipelines, compressor stations, and power plants. It’s time for Governor Cuomo to protect our future by halting all projects that transport, store, and burn fossil fuels! The latest installation of solar panels directly in the path of the Keystone XL pipeline are going up in Nebraska this month. If TransCanada wants to build its dirty tar sands pipeline, they'll have to tear down clean, renewable energy. Solar XL not only provides clean energy, it tells an inspiring story about the people and places who are standing up to resist Trump’s agenda and TransCanada’s dirty tar sands pipeline. Watch this inspiring new film that shares the stories of the people and vision behind #SolarXL - then help build the momentum by sharing it far and wide. This pipeline is not a done deal. In order to build it, TransCanada needs one final permit from Nebraska's Public Service Commission (PSC), which will vote to approve or deny the permit this month. In August, we delivered nearly 500,000 public comments and marched through Nebraska's state capital with our partners to urge the PSC to reject the permit, but that’s not all. The climate movement – including Indigenous leaders, farmers, ranchers, and activists like you – has been fighting for several years to keep dirty tar sands in the ground and stop this and every destructive project like it. This movement is growing and only getting stronger. We're ready to take bold action to protect our water and climate if Keystone XL gets approved. Stay tuned for an announcement before the end of November. 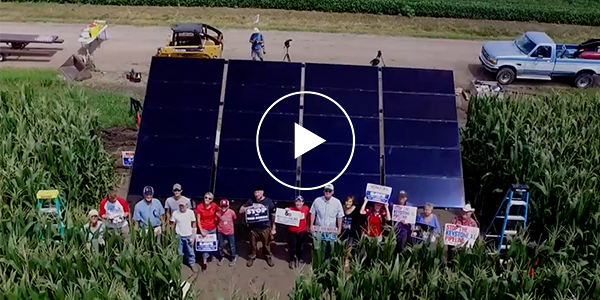 Share this inspiring story of resistance and help keep the pressure on Nebraska to support clean energy, not Keystone XL. This 8-minute film takes you to the Cheyenne River Sioux Reservation in South Dakota where the pipeline would run less than a mile outside its border. It brings you along the river that the Tribe depends on for drinking water that would be contaminated when the pipeline leaks. It also features Jim Carlson and his farm in Nebraska where the first solar installation went up in his family’s corn fields. We learn what this pipeline would mean for his health, family, and well-being and why he’s been fighting this project for seven years. This is what inspiring, community-led resistance looks like – and you can help make it even more powerful by joining this fight. People protest diesel trucks outside Ezra Prentice Homes. STOP buying stuff in plastic bottles!!!! !